En kort spasertur fra leiligheten tar deg til den flotte og varierte strendene fra opptatt og sand til små rullesteinstrender viker, hvorav mange er blått flagg. Det er en hyggelig og vakker spasertur langs kysten til Playa Flamenca, La Zenia for vannsport, Cabo Roig og Punta Prima. Den populære Flamenca Beach kommersielle sentrum ligger bare en kort spasertur fra leiligheten, hvor du finner mange barer, restauranter, butikker og banker. I nærheten ligger også en Go Kart banen. Det er en Aqua park like utenfor Torrevieja som også har en marina og lang promenade. Den fantastiske Terra Mitica temapark, Terra Natura Zoo Park og Aqua Natura badeland er ca 90 minutter unna med bil i nærheten av Benidorm. Vær oppmerksom på at det er røykeforbud inne i leiligheten og ingen husdyr. Begge badene er en-suite med WC og servant. Hoved har badekar, bidet og dusj. Andre har dusj. Begge har gulvvarme. Merknader om overnatting: Barn kan bli overvåket i bassenget fra balkongen. Det er varme i stua for tidlig og sent sesonger. Utenfor: 4 delte bassenger. (3 nyreformet basseng med plaskebasseng for barn, en stor funksjon basseng i sentrum av komplekset). Store hager med tildekkede sol badeplasser. Utstyrsrom: Vaskemaskin. Rengjøring / håndklær / sengetøy / stuepike: Sengetøy og håndklær kan endres på forespørsel, vanligvis ukentlig. Det er en egen lokal avgift for rengjøring / skift av sengetøy € 70. Ta med egne badehåndklær. Annet: Stor balkong utenfor stue og hovedsoverom med bord, fem stoler og parasoll. 4 solsenger, 2 strandstoler, en strand parasoll. The Apartment is nice & clean with everything that you would need & has a lovely pool view but would benefit from Air Con. Nothing was too much trouble & every email I sent asking questions was answered with all the info I required. The overall experience from booking, to arriving was very smooth. Andy Little picked us up from the Airport & was very informative about the area & gave us some good advice. The welcoming bottle of Sangria was well appreciated especially as we landed in the middle of a Heatwave. There is a lot to do for all ages & the resort is very flat which would benefit anyone with mobility issues. All in all we had a very relaxing holiday & won’t hesitate to return next year. Fantastic apartment in great location. Lovely apartment with access to a very nice pool. Very secure and nice touch to receive a bottle of sangria chilling in the fridge on arrival. Thank you very much for the comments, I'm really pleased you enjoyed your stay and look forward to welcoming you back next year. The property was adequate for a holiday. for anyone wanting to sunbath outside around the pool area or take to the beach. The complex itself was very secure and very clean and tidy. The apartment has its own parking spot and the owner has now installed Wi- Fi which is an added bonus. If you are wanting to go to the nearest beach it is approximately 10/15 minutes to walk but you have to negotiate the main road the N332 which is very busy. The easiest way is probably to drive down to Playa Flamenco beach if you have a car but my family found the pool area outside the apartment to be fine. The owners local agent Andy Little was very helpful in fact the first day we arrived we used the toaster which immediately tripped the electric which as it happened we did know how to re-set but I mentioned to Andy that there was a problem with the toaster and 20 minutes later he arrived with a new one. How good is that service. Thanks a lot for the comments, I'm really glad you all had a good holiday. 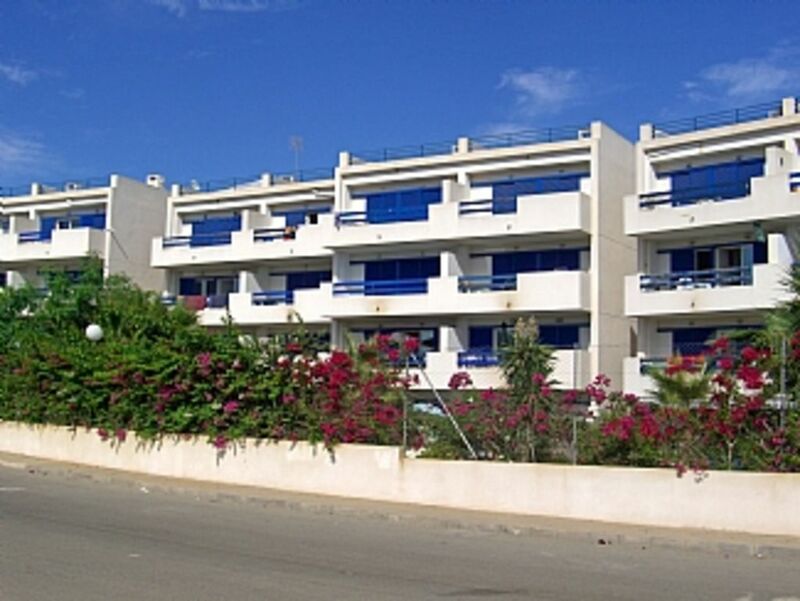 Love La Calma, really good location short walk to shops, bars, restaurants and beach. The apartment was lovely and clean and was fully equipped with all you would need for a self catering holiday. Andy the agent was brilliant. I forgot my passports in the apartment and he raced all the way to the airport for me so I never missed my flight. Would recommend. Det er flere strender innen gangavstand, er den nærmeste stranden en 10 minutter gange. Det er promenader knytte formelle gangveier til seks strendene i sør. Alicante 45 min. Murcia 20 minutter. Airport pickups kan ordnes. Murcia 35 € hver vei (hvis to biler krever 30 € per bil). Alicante 45 € hver vei (hvis to biler kreves 40 € per bil). Strender, restauranter og underholdning er alle innen gangavstand. Booking Notes: A deposit of £50 per week is required within 7 days of booking with the balance paid within 4 weeks of arrival. Contact owner by email or phone. Please note the cleaning fee is paid locally and is 70€. There is a refundable security deposit of 100€ which is payable locally. Changeover Day: Please enquire. Notes on prices: Prices are for the property per week in UK pounds.